I recently obtained a copy of IK Multimedia's Stealth Limiter from their rep Derrick Floyd. It has now become one of my favorites. I like it because it's very transparent and easy to use. I especially like the unity gain monitor which allows you to hear what the limiters processing is doing to the audio without a big jump in audio level. We often interpret louder as better but sometimes that is not the case. The four modes (tight, balanced, harmonics 1, harmonics 2) and "inter-sample peak limiting algorithm" plus available 16 and 24bit dither makes it easy to get a great sounding master. 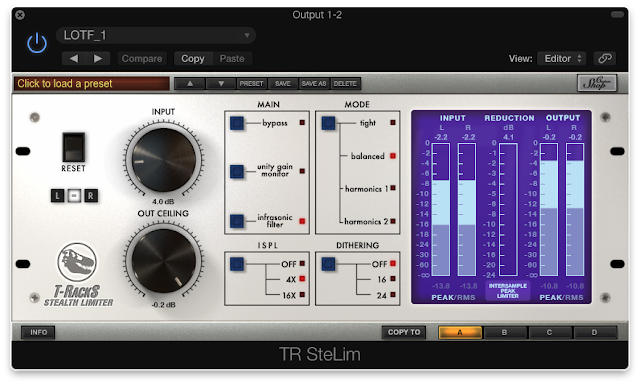 The Stealth Limiter is part of IK Multimedia's T-Racks Custom Shop Mixing and Mastering Collection. It runs on both Mac and PC as an AU, VST and AAX/RTAS plugin. Price $124.99. Download the demo at IK Multimedia's website and hear for yourself on your own material what the Stealth Limiter is capable of.